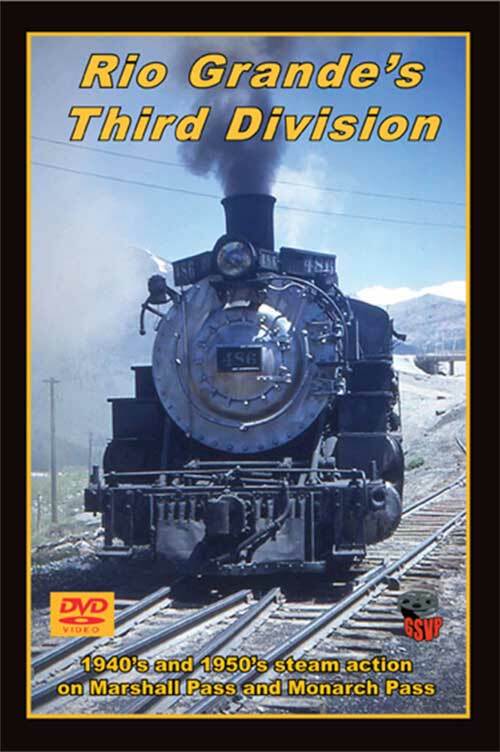 The Gunnison line over Marshall Pass and the Monarch Branch were a part of the D&RGW(Rio Grande) Third Division, which started at Salida, Colorado. In this video we see films from 6 different sources with 95% of it color. We begin in Gunnison and watch engines at the servicing area and see the roundhouse. Later we ride the caboose right behind helper 492 and leaving the helper station at Sargeant, Colorado 492 is the rear pusher, with two more K-37 class engines on the front. After the three engine train we move to Salida and see action on the Monarch Branch as they haul limestone trains from the mine back to Salida. The first segment is single engine trains, then 2-engine trains. In both instances the empties and loads must be split up at Maysville(ugrade), and Monarch(Downgrade return) because no more than 14 cars can fit in the stub of the Garfield switchback. We see this several times in the show, and great views shown including one half of the train moving with an engine on the middle section, and the other half moving at the lower segment after they were split. There is also good coverage from several photographers of the run to Monarch, as well as switching and making up trains, plus turning the engines on the wye. In some cases we have two different angles of the same scenes which is interesting. We also enjoy the Rotary Barrel Dumper which transfers the narrow gauge loads into the standard gauge cars for the last segment of their journey to Pueblo, Colorado. This facility is well documented. There are also cameo appearances of 2-8-0 #268 at the Chicago Worlds Fair in operation, plus a scene of the "Shavano" with engine 479 at Gunnison in the late 1930's. History and locations are either on the screen or narrated as we follow the action. Near the end of the program we see engine 489 on work trains, including when the Monarch line was converted to Standard Gauge. This is a good action show of rare footage from a by-gone era of steam railroading in Colorado. DT (Colorado - Home of the Narrow Gauge) on 2016-01-17 18:49:28. Great scenery. Rare footage of Gunnison, Sargents, Marshall Pass, Mears Junction and Salida and its facilities. listen to me. there is nothing wrong with the video itself. all of these scenes are 100% silent. there are other producers who dubbed fake sounds with silent footages. for example: the video rails classic collectors series. if you have those sets along with the sp overland route dvd, you'll know the differences.